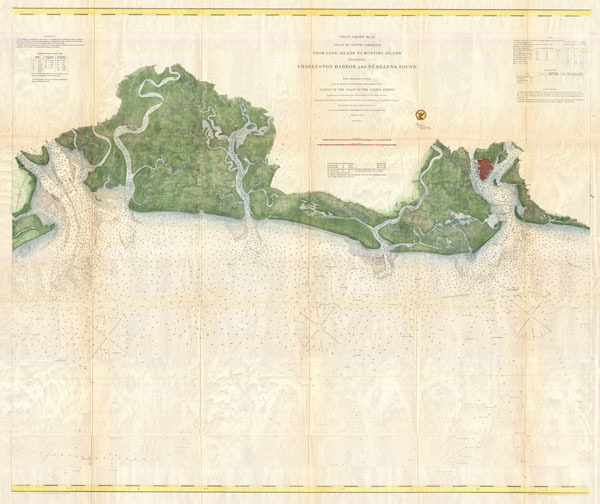 An extremely uncommon chart of the South Carolina Coastlands. Coast Chart No. 53 Coast of South Carolina from Long Island to Hunting Island Including Charleston Charbor and St. Helena Sound. This is a highly unusual and rarely seen 1866 U.S. Coast Survey chart or map of the South Carolina coastline. Covers from St. Helena Bay to Charleston Harbor. Includes the North Edisto River, South Edisto River, Kiwah River, Stono River, Ashley River and Cooper River. Offers stunning inland detail identifying roads, farms, landings, and many individual buildings. Shows a detailed street grid for Charleston City. Nautically this map offers a wealth of practical information for the Mariner, including countless depth soundings and notes on light hoses, tides, shoals, and other undersea dangers. The Triangulation for this chart was completed by A.D. Bache, C. O. Boutelle, and C. P. Bolles. The topography is the work of S. A. Gilbert, J. Seib, R. M Bache, G. D. Wise., W. S. Edwards, and C. Rockwell. The hydrography was completed by a party under the command of J. N. Maffitt, J. P. Bankhead, and C. O. Boutelle. This chart was compiled under the supervision of A. D. Bache, one of the most influential Superintendents in the history of the Coast Survey. Published in the 1867 supplement to the 1866 edition of the Superintendent's Report.